Barcelona winger Ousmane Dembélé is facing up to a month on the sidelines after picking up a hamstring injury during their 5-1 win over Lyon on Wednesday. The France international rounded off the scoring at Camp Nou to ensure Barcelona's place in the quarter finals of the Champions League, with Ernesto Valverde's side the only La Liga team to progress to the quarter finals. But following tests on Thursday, Barcelona confirmed that Dembélé would be out of action for three to four weeks after tearing the femoral biceps muscle in his left hamstring. Dembélé's goal against Lyon was his 14th across all competitions this season and his third in the Champions League, having also found the back of the net against PSV Eindhoven and Tottenham. Mundo Deportivo adds that Barcelona's coaching staff are regretting the decision to bring Dembélé off the bench against Lyon as he has only just returned from a recent ankle injury which saw him miss five games in January and February. The World Cup winner appeared to pick up his injury when he scored the game's final goal at Camp Nou. Dembélé fired a right-footed shot past substitute goalkeeper Mathieu Gorgelin in the last few minutes of the match but almost immediately signalled to the bench about a problem with his left leg. 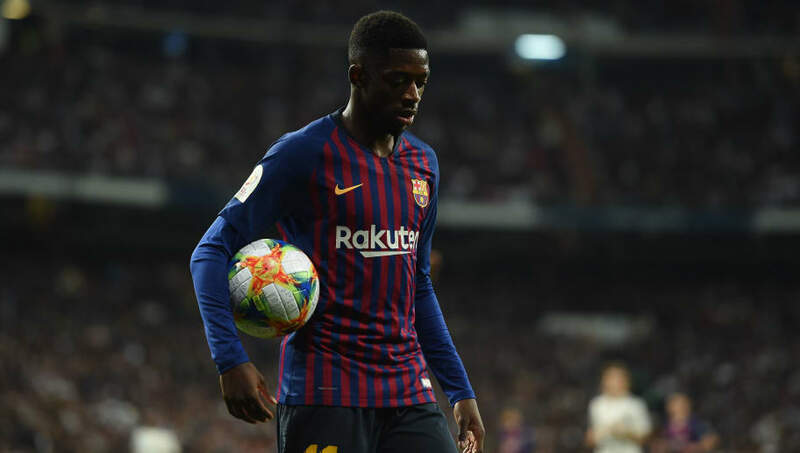 Dembélé will now miss crucial league matches against Real Betis, Espanyol and Villarreal, but he could be looking to return to full fitness ahead of their match against La Liga's second place side Atlético Madrid at the Camp Nou next month.